Be sure to check out the rest of the amazing tour stops by clicking the button. Easy-peasy!! If you love fantasy books for middle schoolers like the Percy Jackson series or young adult adventure books like Harry Potter, you’ll love this! Lars Guignard is a former film and television writer and graduate of both McGill University and the American Film Institute in Los Angeles. His work can be seen on television screens across the globe in such cult classics as Beastmaster and Big Wolf on Campus. Lars's bestselling novel, Lethal Circuit, has been a TOP 100 Amazon Spy Thriller since its release. In addition to the Circuit series, Lars is the author of the children's adventure series, Ghost Leopard, and the paranormal mystery series, Brood. Ever since attending high school in the Indian Himalayas, Lars has been an avid backpacker and traveler. He now makes his home in the Pacific Northwest where he is busy completing the third Michael Chase thriller for release in 2013. In Zoe & Zak and the Ghost Leopard, Zoe and Zak embark on an unintended adventure. When their parents have to go to India on a business trip, Zoe and Zak go too. Their parents get called away on an important task and while they’re away Zoe wants to find the perfect shot to win her photo contest. While by the pool, Zoe and Zak overhear an interesting conversation a man (Rhinobutt) is having and that is where the quest for the Ghost Leopard begins. I think that most of the book was pretty good. It was sort of like an elevator; it had its ups and downs. It was packed with adventure and action. It had funny moments like when Zak got elephant poop as a gift. There was mystery and magic. Everything you could want in a book for kids. The voices for the audio book could have been changed up more. Sometimes it was confusing and it seemed like Zoe was talking when she wasn't. And the Rhino voice was a little weird. I don’t suggest that younger kids read this story because it was a little on the violent side, but I would recommend it for older kids. Overall, I enjoyed this book and think that it is worth reading. Gotta get it now? Well, you should certainly enter the giveaway below for your chance to win one of three available copies in several formats, but if you just can't wait, well do we have a deal for you!! Thanks to CBB Book Tours and Fantastic Press, three of you can be big winners!! This worldwide giveaway gives THREE people the chance to win a copy of Zoe & Zak and the Ghost Leopard as either an audiobook, paperback or e-book! Thanks so much for giving this one a try! And thanks for hosting a tour stop as well! Thanks for your comment. I liked your book! 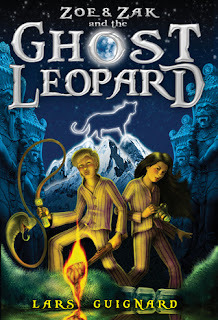 Zoe & Zak and the Ghost Leopard is a well written story that flows so easily and pulls you in as the adventure unfolds. I was captivated from the very beginning and found it hard to put the book down. I highly recommend picking up this story and I can’t wait to read the others in the series.